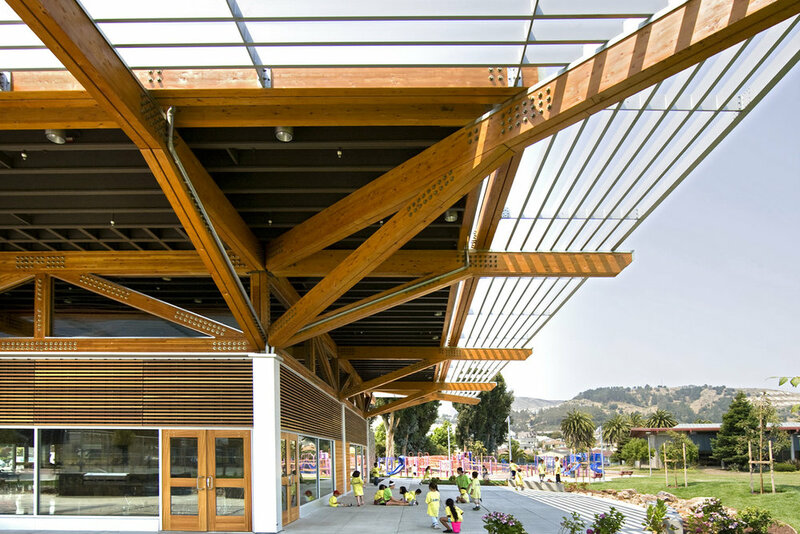 The Orange Memorial Park is an important public recreation venue for the inhabitants of South San Francisco, and provides a vibrant context for the community and recreation center, encircled by soccer fields, picnic areas, basketball courts and other outdoor amenities. The building’s dominant element is an airy, light-filled, central space which hosts cultural, recreational, celebratory, and educational activities. 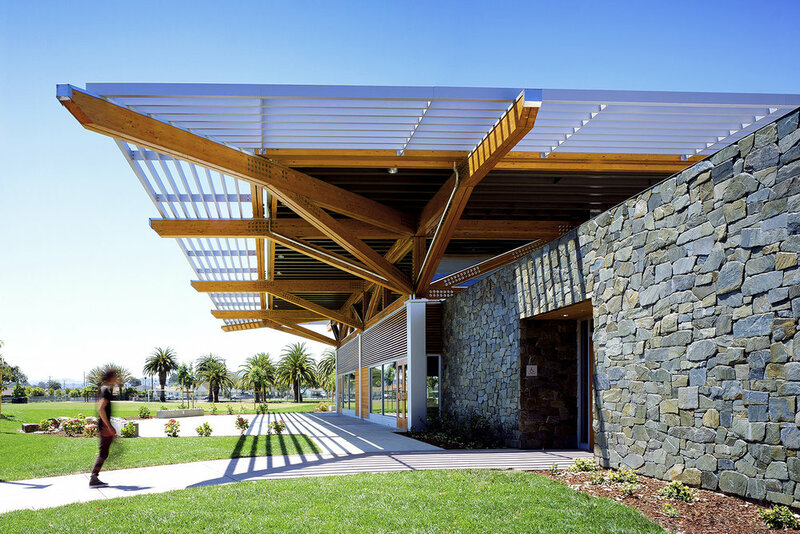 Exposed wood roof-trusses are robustly expressed, and the high structure extends the internal space by cantilevering far beyond the envelope and over the surrounding outdoor patios. 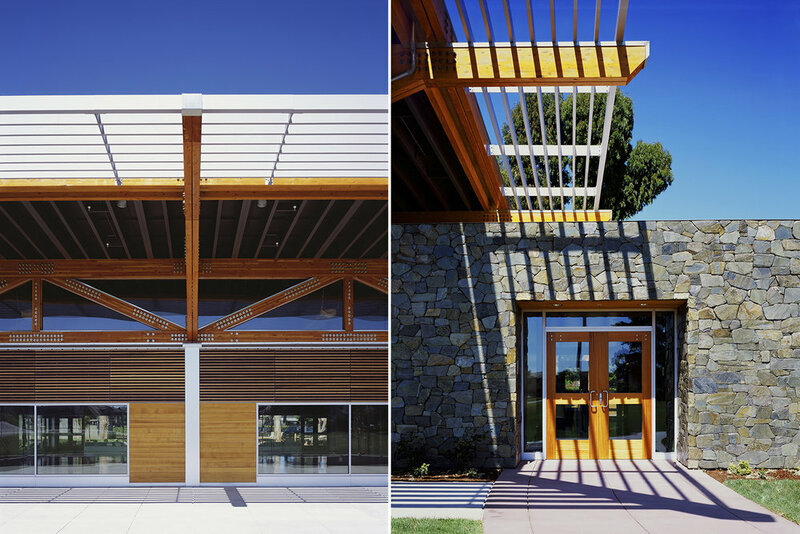 Environmental features also add to the architectural character of the building: the project is sited with regard to solar orientation, and deep overhangs, sunshades, and abundant sun-protected fenestration provide natural day-lighting and views. 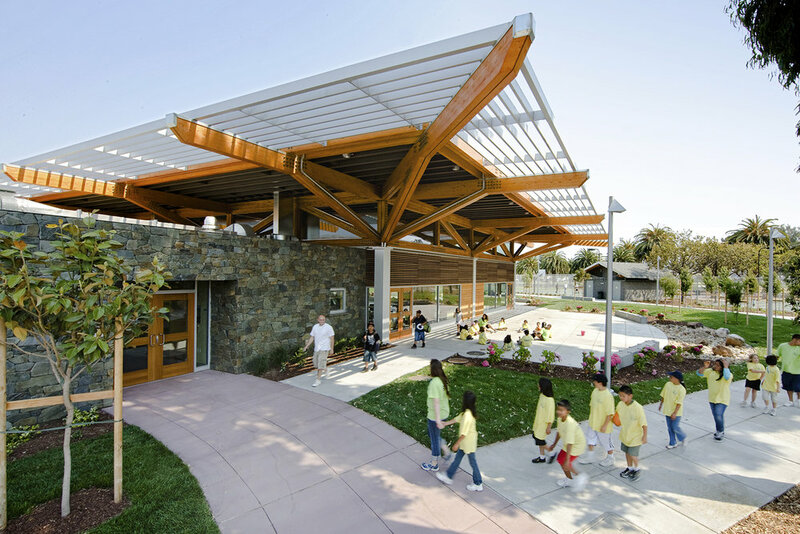 The Pavilion’s striking aesthetic and openness to the surrounding landscape realize the city’s desire to become a visual focal point for the park and an icon for the community. Compositionally, the building is comprised of a juxtaposition of two distinct rectangular masses – one large, light and transparent, housing the Activity Pavilion, with expanses of glass in concert with red and yellow cedar; the other by contrast a smaller box of basalt stone containing the entrance lobby, staff offices, bathrooms, storage, and commercial kitchen. 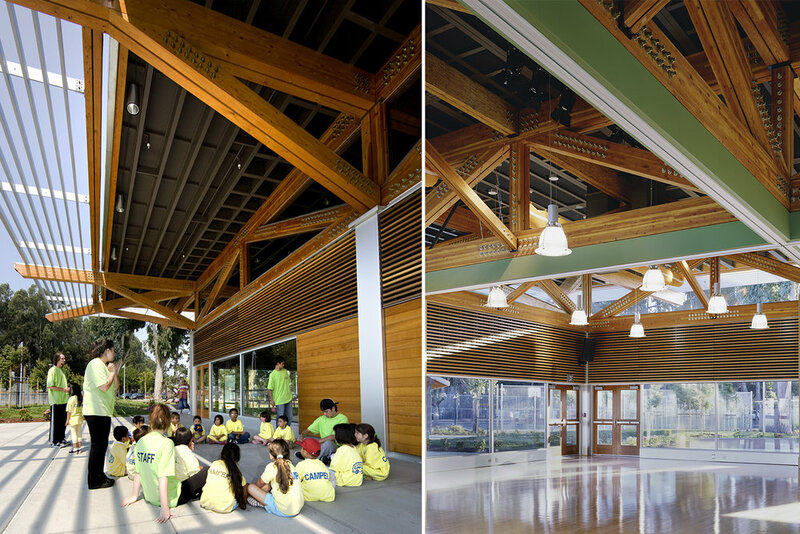 The building’s horizontality is accentuated by the Pavilion roof whose paired glu-lam wood trusses span the 60‘ room; these trusses cantilever beyond the enclosed footprint to provide covered outdoor patio areas, while the sunshade framing extends even farther beyond. The large interior space within has a permeable connection to the park outside with three walls of windows opening up onto patios, sheltered by the building’s deep roof overhangs. These provide a shaded outdoor space for visitors to enjoy the activity of the surrounding park. Thanks to the combination of siting, architectural design, lighting design and mechanical engineering, the project outperforms Title 24 Standards by 16.2%, and qualifies the city for a rebate of thousands of dollars from PG&E.